​There could be different measures to decide which are the world's most powerful passports, however the most commonly accepted measure is to examine the power of every nation’s “key to the world” based on how many countries that can be visited without applying for a visa. A total of 193 countries and territories were included in the "key to the world" index, separated into 95 passport power ranks. ​A country’s ability to obtain visa waivers reflects its diplomatic relations with other countries. In addition to this visa requirements are shaped by security risks, reciprocal visa arrangements, and the risks of visa and immigration rules violations. Germany is the sole winner with 158. The next 6 are in a virtual statistical tie, cascading down to 153. Singapore is the standout from Asia with an impressive 157. The USA and Britain are in equal third spot with a large field of nations from Western Europe. Japan comes in fourth with 155, whilst Malaysia scores 5th with 154. Australia scores 6th with 153. Passport photos above left to right: German passport, sole gold medal winner, by just one visa free country. 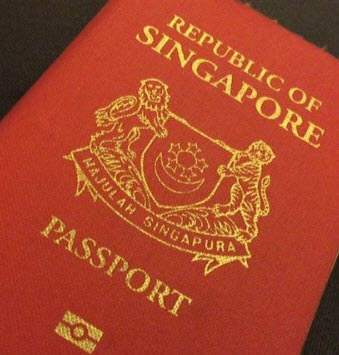 Singapore Passport, statistical tie for Gold medal rank, one visa free country behind Germany. Australian passport ranked 6th place with 153 visa free entries to other countries. Western European countries dominate the rankings as there as so many of them with such large populations in an area less than the size of Australia. Germany is unsurprisingly the winner because it shares borders with so many different countries from regions such as Scandinavia, the North Sea near the English Channel, Eastern Europe and almost to Italy in the Mediterranean, separated only by Switzerland and Austria. Germany is also the economic powerhouse of Europe and considered the glue holding together the current European Union. ​Philippines passport, ranked 64th, marginally ahead of China which was ranked 66th. Barbados brags it has the most powerful passport in the Caribbean region, which is ranked 50th worldwide. Philippines has a score of 60 countries which can be visited without the need for a visa, which ranks the Philippines in 64th spot. ​The Philippines' northern neighbour, China, was ranked slightly behind the Philippines in 66th spot, whilst fellow neighbour to the south, Indonesia, was ranked in 67th spot. ​Fellow Asian giant India ranked 78th spot. ​Afghanistan has held last spot since 2010 with only 25 countries allowing its passport holder to enjoy visa free entry. It's no surprise that Singapore in South East Asia is in a statistical tie with Germany for first place. ​Singapore has made itself into an attractive place for foreign investment, whilst still maintaining its great unique culture. The world is getting smaller and no country can completely close itself off from other countries and still achieve its best potential. The key to international success, or "The Key to the World" is how to balance openness with insularity whilst still maintaining a one's cultural identity. ​as the world's biggest movement of people gets underway! Gong Xi Fa Cai (Mandarin) and Gong Hey Fat Choy (Cantonese), pronounced differently but written the same. Gong Xi / Gong Hey (恭禧) is congratulations or respectfully wishing one joy. ​Fa Cai / Fat Choy (發財) is to become rich or to make money. ​Thus, Gong Xi Fa Cai means wishing you to be prosperous in the coming year. The 28th January is the beginning of the Chinese New Year for 2017. This is the year of the tenth Chinese zodiac, the Rooster (1945, 1957, 1969, 1981, 1993, 2005 and 2017). Those born in 1957 or 2017 are fire roosters, and are considered trustworthy, with a strong sense of timekeeping and responsibility at work. They are also thought to be talkative, popular in a crowd and loyal. Their lucky numbers are thought to be five, seven and eight, and their lucky colours gold, brown and yellow. Photo: Chinese women celebrating a previous Chinese New Year. The Chinese New Year is a time for Chinese family members to get together for China's longest holiday of the year. This celebration is the biggest mass movement of people on the planet. With China's new bullet train network more and more people are now mobile. Photo above: Where's the queue? Many passengers crowd into Guangzhou train station, on the Pearl River, near Shenzen and Hong Kong. It is reported this year that 100,000 passengers have been stranded just at this one station. These are the lucky ones who made it inside. Photo below: The 'not yet lucky' passengers still waiting outside the Guangzhou train station. Hopefully they'll get in soon and have a 恭禧發財! The world continues to progress, and international trade is usually at the forefront. Whilst some countries may contemplate building great walls, others are already trumping this dystopian mindset with a utopian bullet train vision. This vision is using trains to connect countries and bring them closer together in this global village we call earth. In January 2017 the first direct freight service between Yiwu city near Shanghai on China's Pacific coast reached London. As it approached its destination after travelling through the tunnel under the English Channel from France, it broke through a paper banner reading: “First Freight Train from China to UK – Yiwu to London – January 2017” and was showered with confetti. Whilst this was not a bullet train service it was still a great achievement for the so-called "New Silk Road" of trade between the 'Far East" and Europe. The original Silk Road can be traced backed to the Han Dynasty of China, approximately 200BC. Meanwhile China has announced an approximate $250 billion bullet train link to Moscow which is planned to be complete by 2020. ​This will reduce travel time to just two days over the approximate 7,000km plus journey. The grand vision is to extend this high-speed bullet train service to London, which will form the backbone of the 'New Silk Road'. Map above: The 'New Silk Road' rail link in red to Europe with the existing Trans-Siberian rail link through Russia in yellow to the north. Map below: The ancient and original 'Silk Road', traversed by horse, camel and on foot which led from China to Europe through the Middle East. When compared to the 'New Silk Road' map the old 'Silk Road' runs much further to the south. 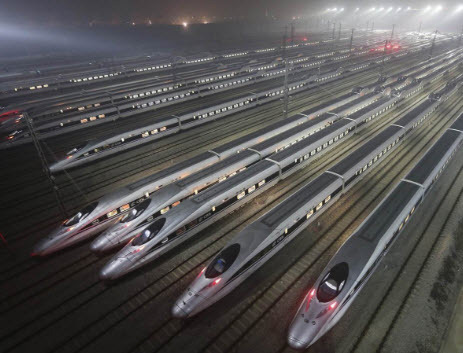 Linking Europe with China with bullet trains will become a major 21st century achievement. Likewise, it's more than probable that most of the human inhabited globe can also be linked with bullet trains using today's technology. Europe to the bottom of South Africa. The whole world could benefit through trade and tourism whilst respecting diversity, culture and independence of all countries. This is far better than useless war and destruction. Using human endeavour to create and cooperate whilst mutually improving everyone's material benefits is a very productive, empowering and moral enterprise. Consequences: Local and global political economics. The new freshly minted President of the USA, Donald Trump, promised in a 'stump speech' (standard campaign speech) during the start of his presidential election campaign to build a wall the length of the US and Mexican borders. The cost of this promise varies but has been estimated up to US$25 billion, making it possibly one of the most expensive political stump speeches in history. There already is a wall of sorts in some parts, as seen in photo above where a vehicle from Mexico is seen dangling on top of the wall after driving up a makeshift ramp. The Great Wall of Trump would be approximately 40 feet tall (over 12 metres). First of all let's look at the effectiveness of any such wall along approximately 3,200 kilometres. A good place to start is with Janet Napolitano, former Governor of Arizona (2003 to 2009), on the US Mexican border, and former US Secretary of Homeland Security (2009 to 2013). No need to explain any more on the height issue without even examining the concept of aircraft including the ever increasing technological and transport capability of drones. In regard to the subterranean depths, the Mexican drug cartels and people-smuggling operations have already built tunnels big enough for cars and train tracks. The Mongol horsemen of the steppe trying to invade past the Great Wall of China never became that sophisticated so they could ride their horses underneath. 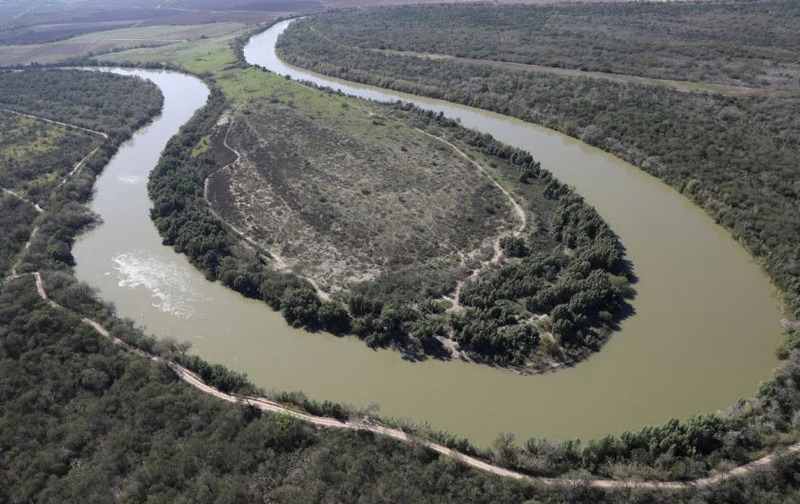 The terrain along the US Mexican border is another major issue, particularly south east of the Texan city of El Paso, where the border stops being a straight administratively drawn line on a map to one which follows the Rio Grande (Grand River) all the way to the Gulf of Mexico. 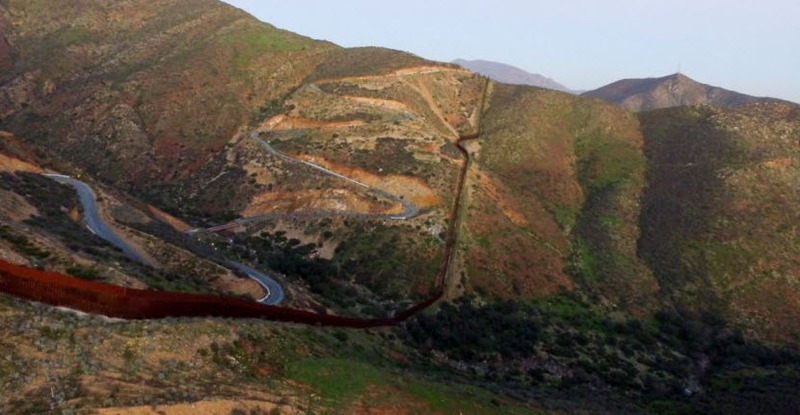 Most of the existing wall is west of El Paso on the neatly drawn border line heading back to California. The Rio Grande is very winding and the border south east of El Paso is the middle point of the river. When the river changes course regularly, this causes border disputes on where the boundary actually is. Also, building a huge wall on the Rio Grande bend in the photo below would be an interesting achievement, if indeed it could be termed an achievement in the practical sense with the wall almost twisting back in on itself to form a very tangled international demarcation line. Such a snakey wall would nonetheless make for a totally unique photo opportunity. Will the Great Trump Wall be a floating wall that can bend and twist with the ebb, flow and changing path of the river border? The Great Wall of China did not follow a river therefore did not have this issue. Also, today the Great Wall of China is very comfortably within modern China, not demarcating any international boundary. Therefore, the Mongols no longer get a chance to graffiti, or further damage it by trying to knock it down, something which the organised lawless element of Mexican society today, such as drug cartels and people smuggling syndicates can do almost at their leisure. According to a Washington Post fact check in September 2016, Hilary Clinton had stated President Trump had declared bankruptcy 6 times with different businesses he's owned, whilst Trump himself said this was incorrect, as he argued it was only 4 times. The Washington Post confirmed Clinton's facts on the above Trump bankruptcy business model as true. Hopefully the national entity of the USA does not become Trump's seventh bankruptcy, and the world economy Trump's 8th bankruptcy. Trump says he will make Mexico pay for the wall by introducing tariffs on Mexican goods to raise over $20 billion. However, maybe he has not calculated that Mexico can do exactly the same to the USA and cause it to lose more than $20 billion in other parts of its economy, not to mention the untold number of other countries which can also do the same. America is putting up physical walls just as it is talking about engaging in protectionism with tariff walls for incoming trade; not just with Mexico, but countries around the world. This in turn can significantly cause a massive reduction in international trade. Countries which turn in on themselves and try to isolate themselves from the international community don't really fix any major problems, but rather create a whole set of new problems. The USA has been the leader of global free trade for the last century which has significantly crafted the international economy which we operate in today. China for example, has made itself rich over the last 4 decades by engaging in the international capitalist trade system since Deng Xiaoping took power from Mao Tse-tung (Zedong) in the late 1970s. If protectionist trade walls go up by different countries with the use of punishing import tariffs in addition to physical walls, then the world international economic system could be headed for a very nasty downturn which could cost hundreds of millions of jobs worldwide, making the 1929 Great Depression look small in comparison. Thus, the world economy could be in a more precarious international balancing act than any car stuck at the top of a border wall. The opposite of a dystopian world view of great walls is a utopian great bullet train system which connects cultures and enhances their economic potential rather than one that divides and restricts them. That's what the second half of the 20th century and first part of the 21st century has been about trying to achieve. Consequently, on a cost benefit analysis, it would be better for the USA to invest money on bullet trains from Alaska, over or under the central American isthmus at Panama and to the bottom of Chile in South America. 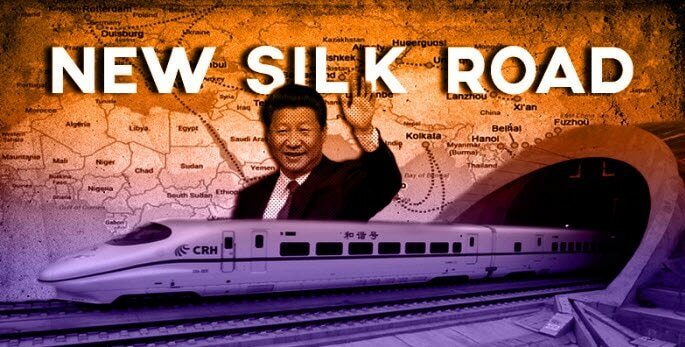 Linking continents with bullet trains is something China is currently working on with a so called "New Silk Road" of trade between Asia and Europe. Marco Polo, who walked the Silk Road after starting his journey in Venice and finishing in Beijing three quarters of a millennium ago, would be highly impressed with this technological transport leap. If a short bridge is then built across the Bering Strait from Alaska to Siberia - just a mere 51 miles - then there could be a continuous bullet train from South America to Asia and Europe. It seems China may be taking on the role of the world's international capitalist whilst America is building protectionist walls to sit on and wave at the world as it passes around it at high development speed. The Great Wall of China was a practical failure in keeping the Mongols out, Consequently, the Trump Wall is highly unlikely to succeed in stopping illegal border flows of contraband, labour and migrants in general as massive walls soon become symbols of historical decay, as well as objects to immediately test and challenge rather than to act as impenetrable barriers. The idea of the New Silk Road is a great alternative positive and forward thinking approach. It would be better for the USA to engage with all countries, especially with its neighbours as well as with other countries such as China, to further develop positive, constructive economic, strategic and political relationships. The world in the 21st century, as compared to thousands of years ago at the beginning of China's dynastic emperor system, is now far too technological and consequently far too small to be building monumental walls of little effectiveness based on little more than politically populist stump promises. A big obvious question is whether significant parts of the Republican Party of the USA will oppose this current blanket wall Presidential proclamation based on common sense? Likewise, many countries around the world, including many people in the USA, would be hoping that the proposed so-called Trumpty Dumpty Wall on the US Mexican border does not become a symbolic catalyst for such a fall. TURNING ON GOOD GENES AND TURNING OFF BAD GENES. in nutritional science called Lunasin. Ramon (Mon) Carpo, who is a popular Sydney media personality as Presenter, Producer and Director for Radio Dalisay, and a member of the dynamic Filpressyd group of Filipino-Australian print, radio and electronic media associations and organisations, has conducted an informative interview with the world renowned Geneticist Dr Alfredo Galvez whilst on tour in Sydney earlier this month. Listen to Dr Galvez as he talks to Mr Carpo about his ﻿discovery of the anti-cancer properties of Lunasin﻿, which can turn on good genes and turn off bad genes in our bodies. This field of science is known as Epigenetics. Lunasin's ability to support cardiovascular health was acknowledged by the American Heart Association (AHA). Dr. Galvez's presentation abstract on Lunasin was also selected for publication in the prestigious AHA Journal. NOTE: RFA would like to express its gratitude to Radio Dalisay in Sydney, and Ramon Carpo in particular for the provision of this interview. Cagliari is the capital city of Sardegna (also known as Sardinia), which is the second largest island in the Mediterranean after Sicily. Sardegna is a beautiful autonomous region of Italy named after a mythological Sardinian hero-god called "Sardus Pater" (Sardinian Father). It is also centrally located close to France, Spain and the micro state of Monaco on the French Riviera coastline. RFA received communication from Marie Luarca-Reyes, Executive Director, ENFiD EU and Honorary Representative to Europe for the Commission on Filipinos Overseas (CFO). Executive Director Luarca-Reyes informed RFA about a Filipino diaspora conference being held in the city of Cagliari, Sardegna, July and August 2015. Please refer to the attachments below relating to this conference. The Philippines has one of the largest diaspora of people in the world. RFA encourages Filipino communities, individuals and friends around the world to make connections with each other. 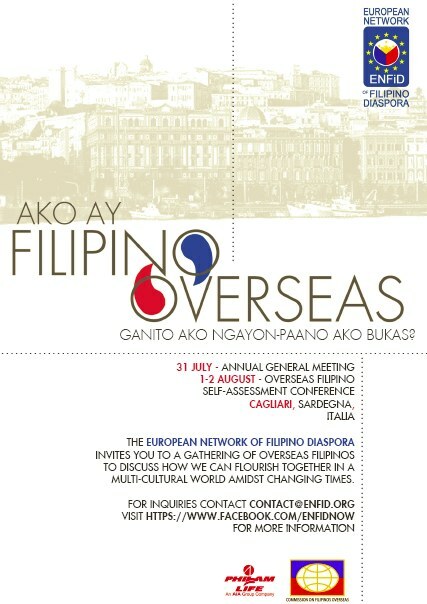 This conference in the Mediterranean would be great opportunity to establish and nurture global Filipino connections whilst also supporting our friends in Europe. 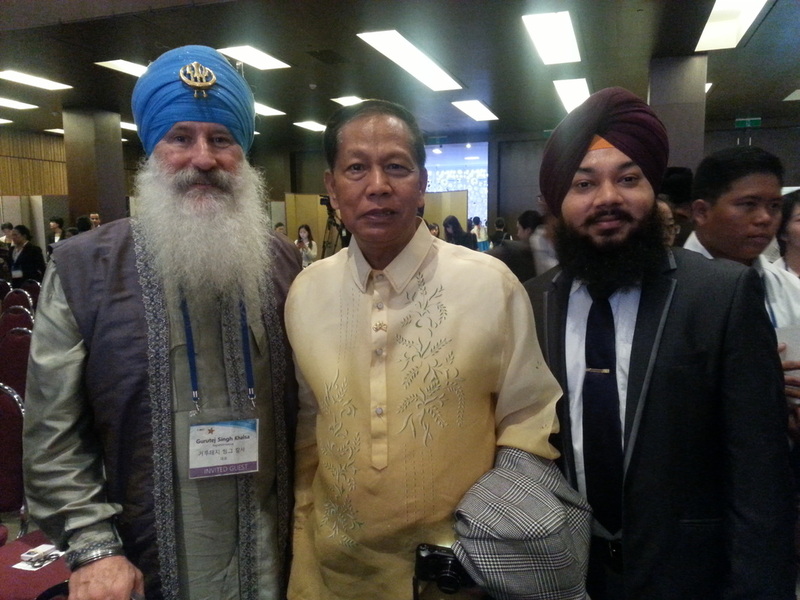 Photos above: Left: Mr Marribay, centre, with two other delegates from around the world. Right: Mr Marribay surrounded by South Korean youth at the stadium for the peace ceremony. Photo Below: The packed out stadium in South Korea for the world peace ceremony (photo courtesy, D.Marribay).